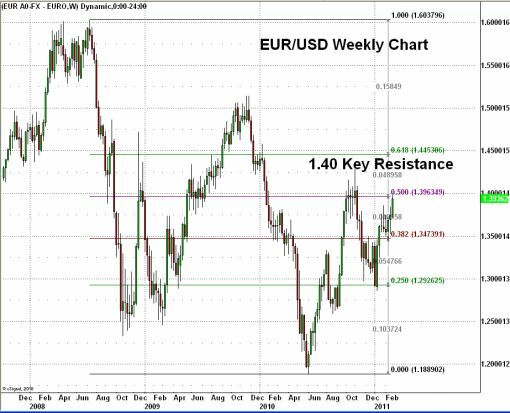 EUR/USD Headed for 1.40 after ECB? Regardless of how much Trichet tried to tone down this comment later on by saying it is not appropriate to expect a “big rate move,” and they are not ready to embark on a “series of rate hikes,” the mere prospect of a rate hike is very positive for the euro. Even if the EUR/USD does not take out 1.40 today, it should just be a matter of time before it does so. Based upon Fed Chairman Ben Bernanke’s comments earlier this week, the U.S. central bank is still straddling the fence in terms of normalizing monetary policy. In contrast, the ECB has sent a very clear signal to the market that rates will increased over the next 1 to 2 months. This dynamic should cause the dollar to continue to underperform against the euro. The race is now between the ECB and BoE and the way its looking, the ECB could be the next central bank to raise interest rates. The central bank upgraded its inflation forecast for 2011 to 2.0 -- 2.6% from 1.3-2.3% forecast in Dec and their 2011 GDP forecast to 1.3-2.1% vs. 0.7-2.1%.